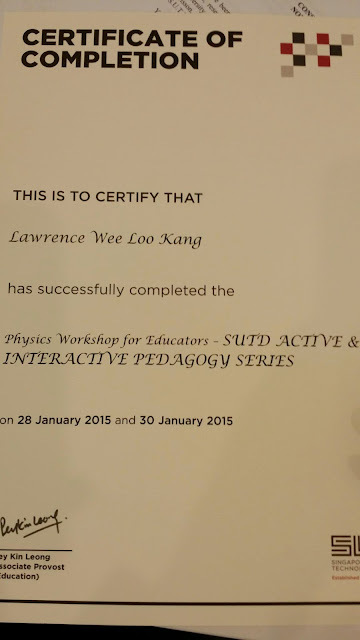 Thank you for registering for the SUTD Physics Workshop for Educators under our Active and Interactive Pedagogy Series. Gentle reminder that the workshop will be taking place on 28 Jan (9am – 5pm) and 30 Jan (9am – noon). Please note that we have moved to our new campus. Our current address is 8 Somapah Road, S(487372). Directions to our school can be found here: http://www.sutd.edu.sg/getting_to_sutd.aspx . For those who are driving, you may wish to park near Lobby J; Parking is free. The reporting venue for tomorrow will be our One Stop Centre @ Campus Centre (Building 3, Level 1). We’ll see you there at 9am. 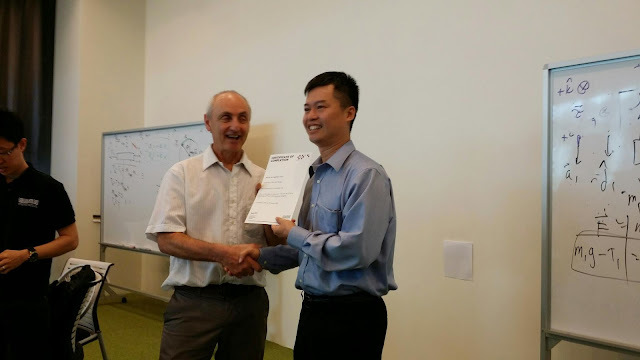 with SUTD Active and Interactive Pedagogy Series - Peter Dourmashkin, taken using my own Note 3, thanks to siew leng YJC. i prepare some slides to share, thanks to Peter's question bank.